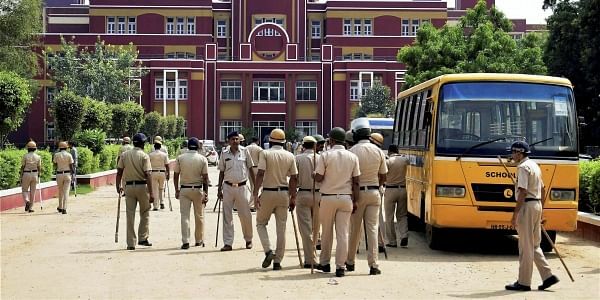 NEW DELHI: In a shocking twist to the probe into the murder of seven-year old Class II student Pradhyuman of Ryan International School, Gurgaon, the Central Bureau of Investigation (CBI) has apprehended a 16-year old Class XI student of the school who allegedly committed the crime to get the parent-teacher meeting and examination postponed. A CBI spokesperson said the child was apprehended at 11.30 PM last night and the murder weapon has also been recovered. The juvenile student has been sent to three-day CBI remand, reports ANI. Earlier, it was reported that the bureau had sought six-day custody of him. "We have come to the conclusion on the basis of CCTV footage, forensic evidence, scientific evidence and call records. The student has been apprehended. He remains our prime suspect," the spokesperson said. In keeping with provisions of the Juvenile Justice Act, the parents of the apprehended suspect were kept in the loop. Pradhyuman was found dead with his throat slit by a sharp-edged weapon in a washroom of the Ryan School on September 8 morning. A knife used in Pradhyuman’s murder has been recovered by the CBI. After committing the murder, the juvenile allegedly dumped the knife in the commode of the washroom. Based on the evidence gathered so far during the probe, the CBI has ruled out any sexual assault on the victim as the apprehended suspect was not known to Pradhyuman, agency sources said. The revelation and the apprehension of the juvenile in connection with the probe trashes Gurgaon police theory that a bus conductor Ashok Kumar had committed the crime. A senior CBI official said the alleged involvement of the juvenile in the crime was first noticed about a month back following which sustained probe was conducted to gather solid evidence before detaining the juvenile. However, he was apprehended after a forensic report on Tuesday further strengthened CBI’s suspicion and confirmed the alleged role of the juvenile. The juvenile will be produced before the Juvenile Justice Board which will decide if the suspect will be treated as a ‘juvenile’ under the Juvenile Justice Act or “child in conflict with law.” If the Board decides to treat the suspect as a juvenile, the apprehended student will be tried under the Juvenile Justice Act and sent to a reformatory till he attains the age of 18 years. However, if the Board treats the suspect as a “child in conflict with law”, murder charges under the Indian Penal Code will apply, agency officials explained. When asked if the IPC section relating to destruction of evidence will be applied in the case in the wake of shoddy probe by Gurgaon police, the officials said the investigations are continuing and a call will be taken subsequently. On a question as to why the suspect wanted to get the parent-teacher meeting and the examination postpones, the CBI officials said the student was weak in studies as per the school records. While the examination of the suspect was scheduled three days after Pradhyuman’s murder, the parent-teacher meeting was scheduled two days later. The sources said the Gurgaon police was aware of the alleged involvement of the suspect but brought the school bus conductor in the picture to apparently shield the juvenile. The CBI has not ruled out hushing up of the probe by Gurgaon police. Whether Pradhyuman was a pre-identified target or not, will be ascertained after further probe. The suspect had brought the weapon to the school premises a day before the murder. The CBI is also investigating whether the weapon of crime was changed during the probe by Gurgaon police.